Gideon Kimosop wins the Larne Half-Marathon. On your marks, get set . . . for another scorching Great Eastern Run. Once again we can look forward to a quality race on Sunday with Kenyans sure to be at the head of proceedings. They’ve ruled the roost in the last six of our popular half-marathons and there’s every reason to suggest it will be a magnificent seven victories. There’s a record entry of 5,500 runners this year but for the winner look no further than this quality quartet - Josphat Kemei, Barnaba Kipkeoch, Gideon Kimosop and Shadrack Korir. Last year we saw a Kenyan 1-2-3 in the form of Philip Keoch, Ben Siwa and Declerk Onyambu with pint-sized Koech hitting the tape in a sizzling 61:40. That smashed Edwin Kipyego’s 2010 course record by a remarkable 36 seconds. And, if conditions suit, the record could go again as the awesome African foursome bust a gut in their dash for the cash (it’s £750 to the winner, £300 to the runner-up and £150 for the third-placed runner). Josphat Kemei wins the Wilmslow Half-Marathon. In most cases the Kenyans who race over here are desperate for money. Kimosop, for example, is the sole provider for his parents, 10 brothers and sisters and their children plus his own wife and daughter back home in the Rift Valley. 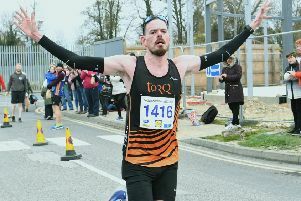 Kimosop (28) has a personal best of 63:09 - set when finishing second to Siwa in last year’s Cardiff Half-Marathon - and has won some top races this year including the Omagh Half-Marathon and the Larne Half-Marathon. But, if the formbook is anything to go by, he’ll have to produce the race of his life to take the top prize. Red-hot favourite has to be Korir, who arrives fresh from a record-breaking run seven days ago in Wales. The former World Championship 1500m bronze medallist, now 37 years old, won the big Cardiff Half-Marathon on Sunday in a blistering 60:54 with Kimosop seventh in 63:14. Kemei and Kipkoech have both entered with predicted finish times of 62 minutes. Kipkoech won the Robin Hood Nottingham Half-Marathon two weeks ago in 65:55 and on the same day Kemei won the Ealing Half Marathon by an eight-minute margin in 64:14, beating the previous course record by 19 seconds. It was, however, a very windy day and in calmer conditions they will go much faster. Kemei also won the Wilmslow Half-Marathon in very cold, blustery coniditons back in April in 64:59. Best of the British contingent could well be local star Aaron Scott, the Stamford-based Lincoln Wellington athlete who runs second claim for Nene Valley Harriers. On his last appearance in the race in 2013 he placed fourth behind three Kenyans in 67:34. This year he has won the Cambridge and Newmarket Half-Marathons and was fifth in a high-class Bath race in a personal best (PB) 65:50. Other top Brits include Notts AC pair Ben Livesey and Stuart Spencer. Livesey has a PB of 65:53 set in Reading in 2014 while Spencer ran 66:06 in a race in Holland last year. At the time of going to press only one Kenyan star had entered the women’s race. That was Teresiah Omosa, who finished fourth in Sunday’s Cardiff Half-Marathon behind three other Kenyans in 73.08. The previous weekend she won the Ealing race in 74:45. The women’s course record is 72:14 set by Liz Yelling in 2011.